Yeah, everyone takes this picture, you have to if you are in the area. 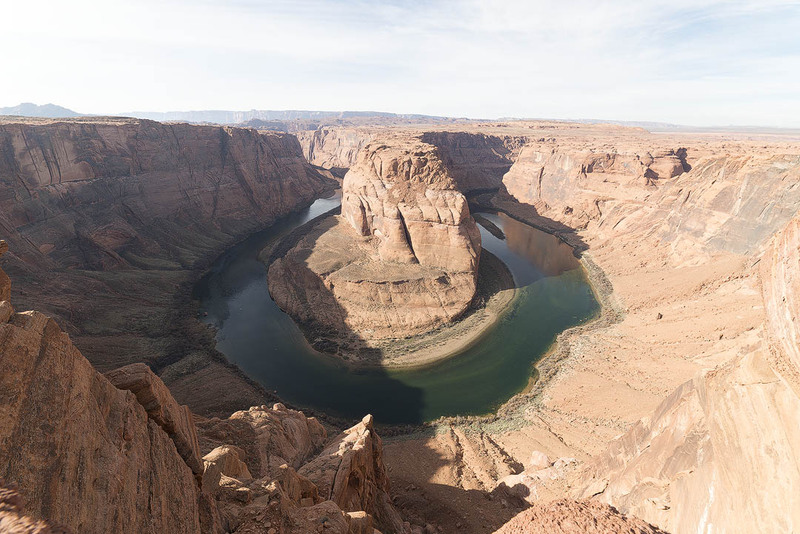 Stopping by Horseshoe Bend, just outside of Page, AZ, is very easy to do, and anyone can walk right up to the canyon edge. Surprisingly, the bend is unlike many other easy to access US park areas with huge cliffs- here, you can go right up to the edge without a railing or any other barriers! The bend faces east/west, which gives a few options for shooting in differing light. Sunrise casts a shadow from the east/outside edge, but this disappears during the middle of the day when the sun is overhead. Of course, the sen sets behind the canyon, making for a great photo opportunity in the evening (like most pictures you see online). I shot the above picture at about 1PM, not a bad time. However this was on December 21st, the shortest day of the year (not a great time of year for this location), when the sun is farthest south. Therefore, despite being midday, the southern sun meant the south rim cast the shadow you see above. While this was about the best light at this time of year, as sunset is not at a good angle, I would enjoying going back during the summer months to re-shoot it. Tip: before you go, plan out when to visit using www.suncalc.net. 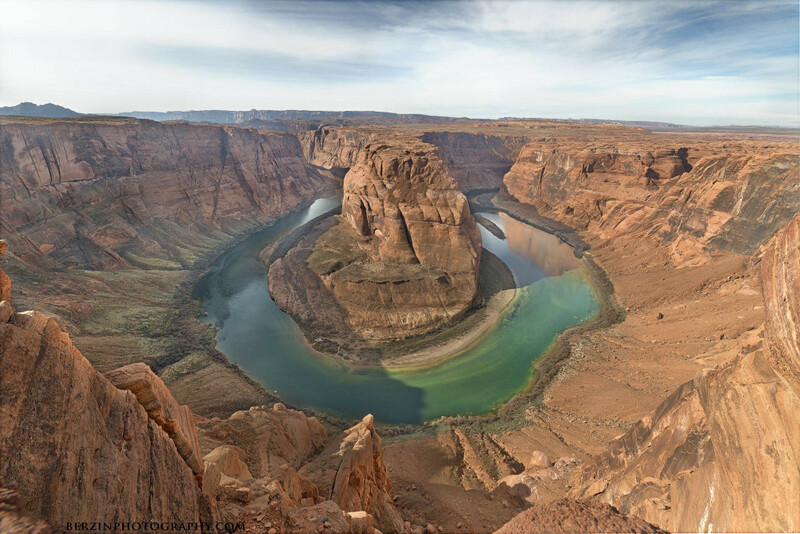 Due to the deep canyon, shadows, and sun position, this view covers a wide dynamic range. 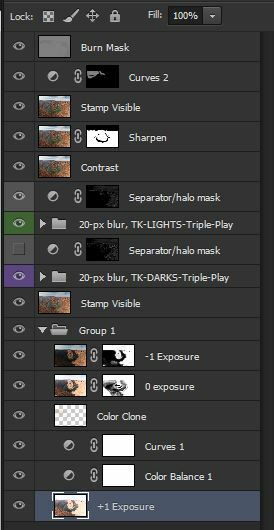 To get better photos, you will want to take a bracketed set of pictures, and combine them in an HDR-like process (though be careful on how you do it- googling this shot will deliver lots of overcooked HDR results). I took brackets of 5 shots from -2 to +2 EV, but for the above finished product used only the +/- 1. A snip of my photoshop layers used to make this photo is to the right. First, I started by hand blending (paintbrush and Wacom tablet) the 3 originals using luminosity masks. My method here was to mask out all of the -1 and only allow through the lights of that exposure. Then, for the 0 EV shot, I allowed everything through, and masked out all of the darks on that shot, allowing through those areas of the +1 EV. You can also see I made some curve adjustments and color balance adjustments to fix the overexposed shot, as well as some light color painting in specific areas. Once the originals were sufficiently blended (getting the river and banks too look right took a while), I made a new layer of everything visible, and went to work with two of Tony Kuyper’s editing actions- these green and purple sets of layers use luminosity masks to selectively multiply and screen lights and darks, increasing details and changing the brightness of certain areas (see post here for more on his actions). After finishing those tweaks, I made an overall contrast adjustment and then sharpening. Sharpening was done using the Nik software, and I manually masked it from certain bright areas to avoid adding noise. Finally, I made a slight curves adjustment to the left canyon wall, and the some touch ups using the burn tool. While this is “finished,” it’s a cool shot that I could keep coming back to edit. Have a look at the below before and after comparison, using the finished shot, and the 0 EV original (which really ended up as overexposed due to the metering of the shadows). Like the photo? Buy one here!